This country belongs to all of us,” affirmed President José Ramos-Horta of East Timor, adding with a smile, “Heaven, of course, may be divided up.” It was a lighthearted way of pointing out that there is full religious freedom under the constitution, and all religions are free to pursue their faith goals. East Timor has the distinction of being the first new sovereign state of the twenty-first century. How it attained that status is a tale of invasion, violence, and religious forces in conflict. 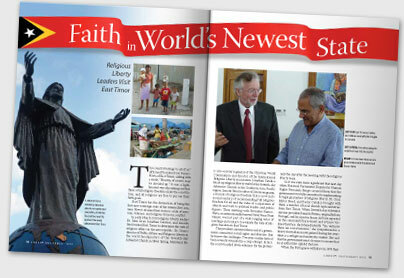 In early March 2010 religious liberty leaders Dr. John Graz, Jonathan Catolico, and Lincoln Steed visited East Timor to determine the state of religious affairs in the new republic. Dr. Graz is director of Public Affairs and Religious Liberty at the world headquarters of the Seventh-day Adventist Church in Silver Spring, Maryland. He is also secretary-general of the Christian World Communion and director of the International Religious Liberty Association. Jonathan Catolico heads up religious liberty work for the Seventh-day Adventist Church in the Southern Asia-Pacific region. Lincoln Steed is editor of Liberty magazine, a journal of religious freedom that is now in its second century of recommending full religious freedom for all and the value of a separation of church and state to political leaders and public figures. Their meeting with President Ramos-Horta, an internationally known Nobel Peace Prize winner, was just part of a wide-ranging series of meetings and contacts to evaluate the state of religious freedom in East Timor. Dr. John Graz discusses religious freedom with President Jose Ramos-Horta. The president conveyed the mood of a government committed to full rights and liberties. But he knows the challenges. Two years earlier he had been severely wounded in a coup attempt. In fact, the courts handed down sentences for the plotters only the day after the meetings with the religious liberty team. So it was even more significant that next day when National Parliament Deputy for Human Rights Fernanda Borges assured them that the government was fully committed to implementing its legal guarantees of religious liberty. 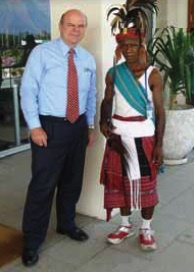 Dr. Graz, Editor Steed, and Pastor Catolico brought with them a number of local church representatives from East Timor. When Seventh-day Adventist mission president Ronaldo Pereira, originally from Portugal, and local pastor Inaciu da Kosta reported on the community harassment and at times violence they face, she listened intently. “Yes, we know there are social tensions,” she sympathized in a heavy Australian accent gained during her years there as a refugee and university student. She said that the government must do more to ensure that local authorities uphold the laws. When the Portuguese withdrew in 1975 they left some Roman Catholic influence. But it was largely in protest at the ensuing invasion by largely Muslim Indonesia that the population en masse adopted a Roman Catholic identity—even as animism continues to exert a strong hold on their society. Today Protestant missionaries encounter severe restriction in local communities and operate on the margins. Liberty editor Lincoln E. Steed and one of the presidential guard in ceremonial dress. When the delegation told Deputy Borges that Adventist young people were often expelled from government schools and were being severely downgraded because of their refusal to attend school on Saturday, she reacted promptly. Turning to other parliamentarians in the room, she directed that they look to changing such religiously oppressive requirements. It is obvious that while there is a problem, the young nation of East Timor has a resolution to establish a religious safe haven. The delegation met with representatives of various Protestant groups as well as the bishop of Dili, Antonio Ricardo. They met the deputy minister of education, the vice prime minister, and the leader of the opposition Fretilin Party. 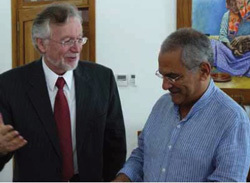 They met with top U.S. Embassy officials and with Juan Carlos Rey, ambassador for the European Union. All affirmed that East Timor has crushing problems, a difficult history, but a firm commitment to ebuild and protect any faith expression. In the years covering Indonesian invasion, annexation, U.N. referendum for independence, and then civil war, this tiny nation lost as much as a quarter of its population. Today its capital, Dili, is a hodgepodge of poverty and foreign aid projects. Its streets are still patrolled by white U.N. vehicles. There is still a sense of unfinished business. It would seem that full religious freedom and interreligious harmony offer a solid base for future harmony. After the 1975 invasion Indonesia installed a huge statue of Christ on a headland just outside Dili. It was a gift from a Muslim society, intended to placate the new Christian conquest. After the withdrawal, locals trashed the monument and the surrounding park. Of late the government has spent much time and money restoring the monument.  It is a good beginning. Lincoln E. Steed is author of Liberty magazine.